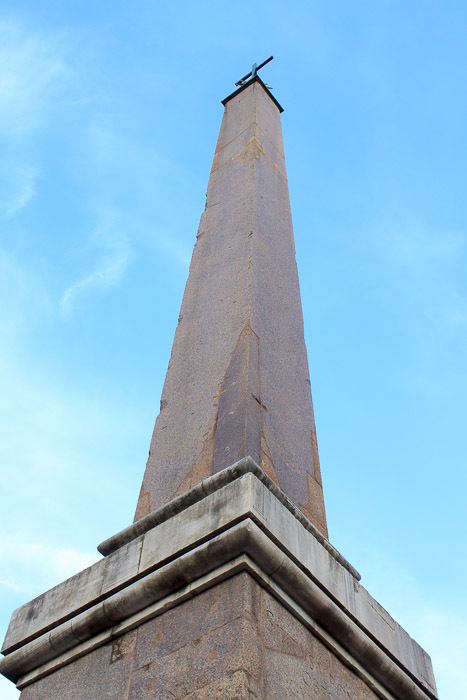 The Esquiline Obelisk is 48.4 feet tall (83.8 feet with base), has no hieroglyphics, and is a Roman imitiation of an Egyptian obelisk. This, and its sister obelisk, the Quirinal Obelisk, were probably quarried by the Romans in the late first century AD. This one was erected on the western flank of the Mausuleum of Augustus, paired with the Quirinal Obelisk on the eastern flank. Both obelisks fell into pieces and as the area was often flooded by the Tiber River they disappeared into the ground under a covering of silt. In 1519 the opening of Via di Ripetta led to the discovery of one of them. This one was in four pieces which were assembled near the church of San Rocco in 1527. Sixtus V had the obelisk repaired and placed in 1587 at the end of Strada Felice, a new street he had opened to reach Santa Maria Maggiore. 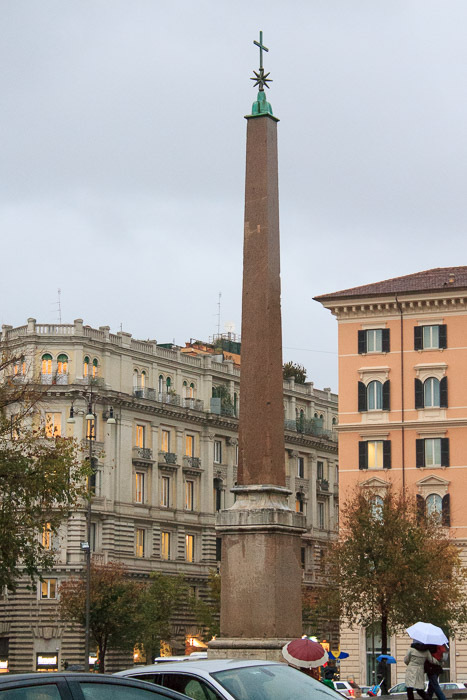 The top of the obelisk is decorated with the mountains and the star of Sixtus V. The Esquiline Obelisk (along with the Quirinal Obelisk and the Sallustian Obelisk) can be seen from the corner of the four fountains, at the intersection of Via 20 Settembre and Via delle Quattro Fontane. See all Esquiline Obelisk photos.